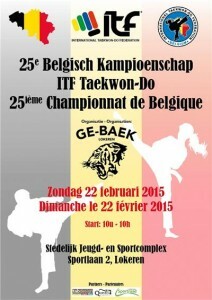 In 2015 ITF-Belgium is existing 25 years, so this 22nd February the 25th Belgian Championships were organized. Location was the youth & sportscomplex of Lokeren, the organisation was done by the club Ge-Baek in cooperation with the ITF-Belgium Umpire & Tournament Committee. It was a great honour to have 2 Masters present : Master Frank Vanberghen, 8th degree, pioneer of the federation and Master Stefan Schmitt, 7th degree, already member of ITF for years. Both Masters were helping out as umpires, a good example for the members. This edition of the BC had a record number of participants : 164 competitors, 20 coaches, 30 umpires, and a number of assistants and volunteers. There was competition in tul, teamtul, pre-arranged sparring, sparring, special techniques and power breaking. 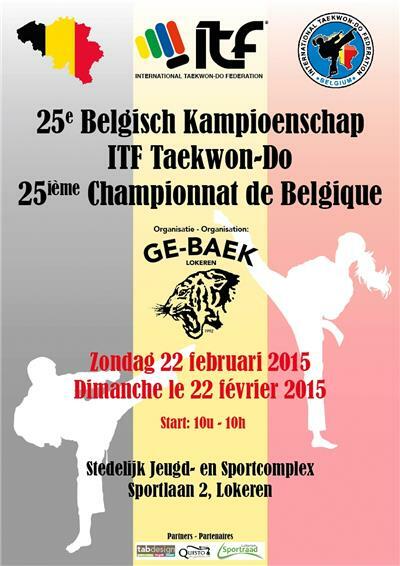 It was great to see that so many youth members competed, this is the future of ITF-Belgium. The level was very high in all disciplines, and it was good to notice that medals were won by competitors of all participating clubs : Taekwon-Do Norden, Bushido, Samjok-O, ITF Brussels, ITF Etterbeek, ITF Woluwe, Hodori, So-San, Chon-ji, Won-Hyo and Ge-Baek. Besides the medals there were certificates for all competitors and coaches, and for all the umpires. There were also trophees for the overall winners, the schools with the most points, with separate categories for youth and juniors/seniors. At the opening of the competition, there was the opportunity not only to thank some persons, to present the schools, but also to announce the team that will represent Belgium at the upcoming World Championships. Many thanks to the sponsors : Tabdesign, Quisto & Stad Lokeren.